In desktop mode, regular applications such as Office, WinZip, Your App Built with Harbour, etc... will run as they do now on Windows 7. Also, all the applications we wrote in .NET (or will write in .NET 4.5), will run here with nothing really different than before. So, with Windows 8, we can say that we have 2 environments where applications can run: in the desktop mode and in the Metro environment. No application can run in both environments. It’s not possible for a desktop application to run in the Metro environment. 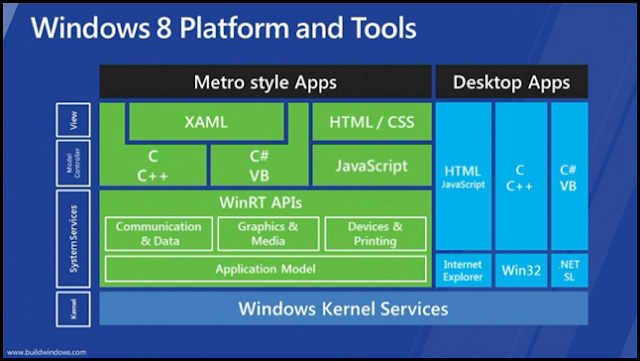 It’s also not possible for a Metro application (built with WinRT as we’ll see in further articles) to run in the desktop environment. There’s a clean separation between the two. Another way of thinking of this is the following. Although technically not correct, we can think of the Metro environment as a shell on top of the desktop mode which can in turn run Metro applications. The Metro environment is tightly linked to the desktop mode. In the current version, there’s no Start menu anymore in the desktop mode. When clicking on the Windows Orb button in the left button corner, we’re taken back to the Metro environment. So, one could say that the Metro environment is also an extended Start menu which is now capable of running applications. However, I don’t really support thinking of the Metro environment in this way.